IF ASKED, MOST PEOPLE WILL name their favorite animal. 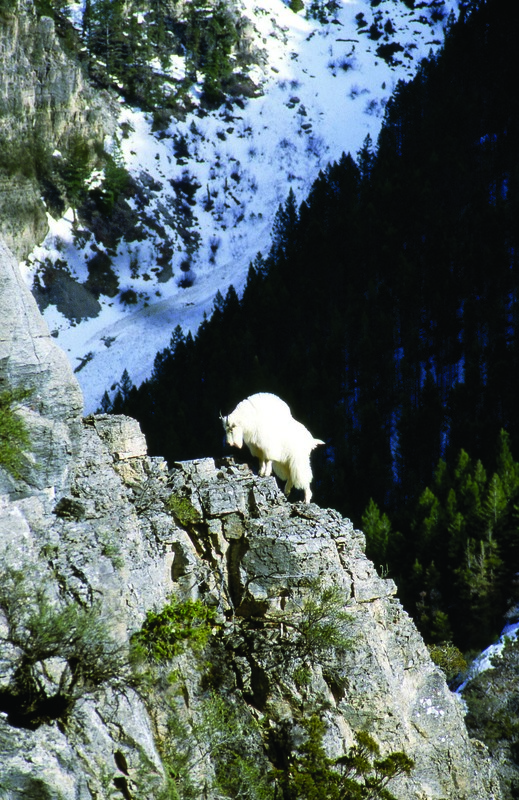 Mine is perhaps the most extraordinary mountaineer to ever live — the mountain goat. I’ve admired the shaggy beast and its lofty lifestyle for many years. But for me, one singular August morning captured the wonder of the animal’s realm. Beyond the ragged divide I straddled between two glacier-gouged canyons in Montana’s Bitterroot Mountains, a broad cirque basin sprawled in the yawning shadow of two majestic peaks. Through binoculars and tripod-mounted spotting scope, I scanned sweeps of granite, flowered gardens and melting snowdrifts for the Old Man of the Mountains. Rewarding my squinting, a display of wildlife burst from that grand mosaic. A pika announced her presence from a sunny balcony — “Eeeeek!” — then returned to stockpiling hay for the upcoming winter. Grey-crowned rosy finches flicked in and out of cracks in cliffs where they may have raised another year’s brood. A half-mile away, a dark object caught my eye. Popping like a periscope from a jumble of boulders, a wolverine came bounding my way. Like a game of hide and seek, he would navigate hidden pathways then reappear ever closer to appraise his intended prey. One of the hoary marmots spotted the would-be assassin. He whistled a high-pitched alarm to his less vigilant companions who were cavorting on snowbanks or grazing glacier lilies. When the hunter materialized within striking range, the 10-pound rodents vanished as if swallowed by the mountain. After a brief investigation, the wolverine scaled an escarpment as steep as a cow’s face. Faster than seemed possible, he was out of sight. The only thing missing was a Nature film crew. As this drama unfolded, a swarm of ladybugs swirled around me. Some crawled on my legs and arms. One nipped my neck as if mistaking the green parka-clad intruder for an oversized aphid. Surveying all this from a wedge of granite encircled by pink-petaled heather and yellow-plumed groundsels was a lone billy goat. Like a benign ruler of a magic kingdom, maybe he, like me, regarded everything in perfect order on his mountain. That was in 1974, a year that I spent every week from late May — when the first goat kids are born — backpacking through 150 square miles of the Bitterroot Mountains, until snow drove me out in late October. 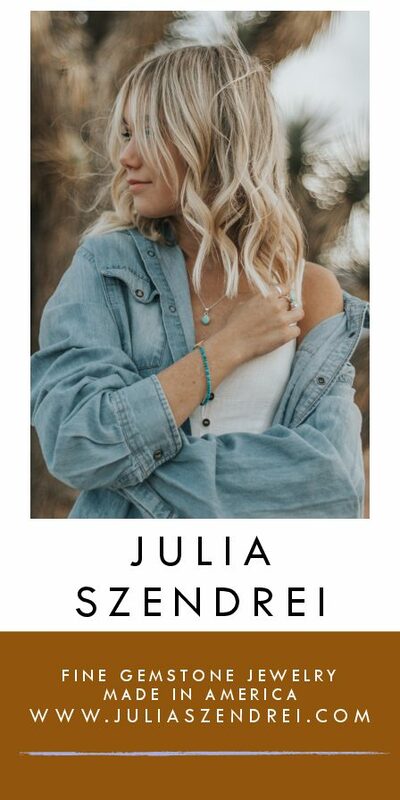 I’d leaped at the chance to spend much of three years at altitude studying the animal’s ecology for a graduate degree at the University of Montana. Those five- or six-day, off-trail trips in 1974 took me across the ridges dividing the range’s parallel canyons. None was more memorable than this August trek through some of the most goat-worthy country the Selway-Bitterroot Wilderness offers. Four decades later, I returned during the last week of July to this place that lodged in my heart and launched my science career. Would it rekindle cherished memories? But foremost, would I find descendants of my old friends still gracing the heights? To be exact, 2013 was 39 years later. But once you qualify for the Medicare rolls, a year here or there can get lost, like gold dust sifting through a saloon floor’s cracks. Were it not for her asthma, my wife Diana would have joined me. By default, this trip was like the one in 1974. I was on my own — with one exception. She insisted I pack a cell phone. I’m not a fan of cell phones. Never saw the need to own one. Secure in the mountaineering skills and bushcraft I’d nurtured over the years, such techie devices seem like a pointless crutch. Besides, I enjoy the uninterrupted sounds of wind through trees, tumbling water and the wild critters’ calls. 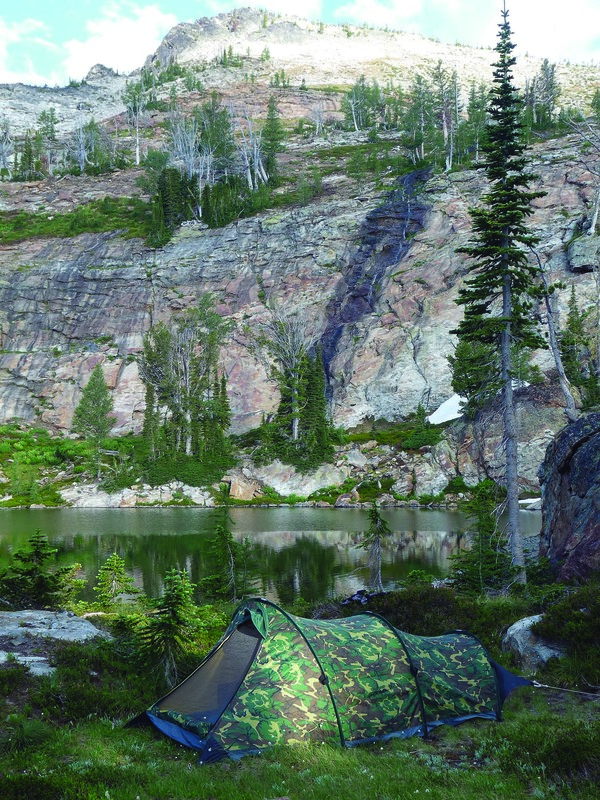 A sure sign you’re alone in the wilderness is that you don’t hear human voices. If you do, you’re either talking to yourself or to the rocks. Unless, of course, a pesky cell phone rings. The trek began early on July 24 at the St. Mary’s Peak trailhead (elevation 6,800 feet). Three-and-a-half-miles in, I left the trail and busted through a tangle of dwarf whitebark pine and subalpine fir to the shoulder of St. Mary at 9,000 feet. 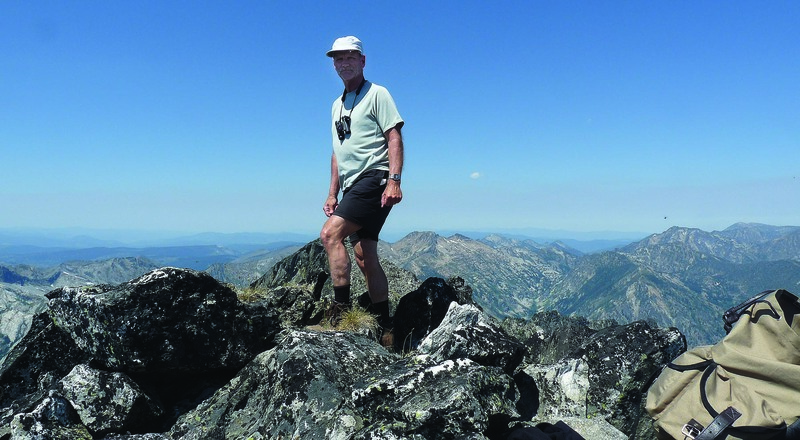 Nearly three miles west towered the Heavenly Twins, aptly named granite spires that are among the highest summits in the northern Bitterroot Range. In between, gaped two glacial cirques. The nearest one sheltered St. Mary’s Lake, my intended campsite. There, the route plunged 1,200 feet through scattered forest, downfall, loose rock and beargrass to the basin, and then outcrops, ledges and ravines to the lake. Such treacherous travel with a full pack is a writer’s bonanza, as colorful adjectives randomly bubble forth. But the three words that kept coming to mind were big, brutal and dry. The country — and how much remained to be travelled — seemed bigger than I remembered. Things often seem bigger when we’re children than when adults. Although I was an adult in 1974, the land seemed more expansive than before, perhaps because I was driven then, and my boots ate up the mountains in big chunks. I was on a mission to learn all I could about mountain goats and the wonderland they called home. It was all so new and exciting and challenging. During the steep descent to the lake, I quickly got a wakeup call. A loose rock rolled beneath a carelessly placed step, resulting in a tumble. I redoubled my concentration to plan each step. Not once in the journals I kept from 1974 do I mention the mountaineering being difficult, surely not brutal. Not the climbing with 65 pounds strapped on my back, nor navigating boulder fields and cliff ledges under the constant resistance of gravity, day after 12-hour day. My notes only recount the animals I saw, with lengthy narratives detailing their behavior: what plants they nibbled, where they travelled and bedded, and the peaceful interactions and sometimes aggression I observed among group members. I had planned to train for this journey, knowing that it would be grueling and my staying power would be tested. But almost three weeks before my departure, I landed a wicked head cold and sinus infection — something for which my doctor prescribed antibiotics and Diana prescribed forgoing my morning runs until I recovered. What I’d intended to do, a couple of weeks before the trip, was to load a 60-pound sandbag into my backpack and hike up and down a mountain trail not far from our home. The week before leaving I loaded the sandbag. With raised eyebrows and a fanny pack, Diana joined me on two of these training jaunts. On that first slog up the mountain, my hip joints screamed in protest, unaccustomed to bearing such weight. The second was better. Thanks to those training miles the week before, my hips merely ached when I reached St. Mary’s Lake. The third adjective was dry; the lack of recent precipitation having left the soil parched and dusty. In the Rockies, dry and hot seem to go together. Even at 8,000 to 9,000 feet, the temperature reached into the 80s. Vegetation was senescing and remnant snow seemed scarcer than I remembered. Most of the beargrass had gone to seed, and although swathes of the signature plant of the Bitterroot high country, mountain heath, bore their bell-shaped, pink blooms, I found patches that were brown and brittle, maybe dead. As I crested a final fold in the bedrock encircling St. Mary’s Lake, I was stunned to see a fire ring in the shoreline meadow. An old ring, from years prior, but a fire ring nonetheless. Throughout 1974, I don’t recall seeing any evidence of human presence during my off-trail mountaineering. The next day I struck out west, carrying just a daypack with spotting scope, tripod, camera, water and food. I aimed to see as much of this country as daylight and my legs allowed, with designs on scaling the Heavenly Twins. In 1974, when I reached the south summit — the higher of the two at 9,282 feet — I was greeted by wraparound views of peaks and lakes, and by a swarm of ladybug beetles that alighted on me. This time, a flurry of delicate white butterflies swirled like a tiny snowstorm at the top. Joining in were assorted bees, flies and a flight of winged ants. From the roof of the world, I scanned four cirques whose glaciers had once ground headwalls that now shape these twin pinnacles. Glades of lilies, whistles of marmots and the dog toy squeaks of pikas treated my eyes and ears. I wasn’t surprised to spot no wolverines. They’re elusive vagabonds rarely seen by the most seasoned mountaineers. But disturbingly, not a single mountain goat was anywhere to be seen. Even an old goat spotter, I suppose, can overlook an animal in this jumbled mosaic of wind-racked trees, splotches of meadow, and silvery granite and gneiss. But the clincher was that in three days I found no tracks or droppings, no beds or dust wallows. 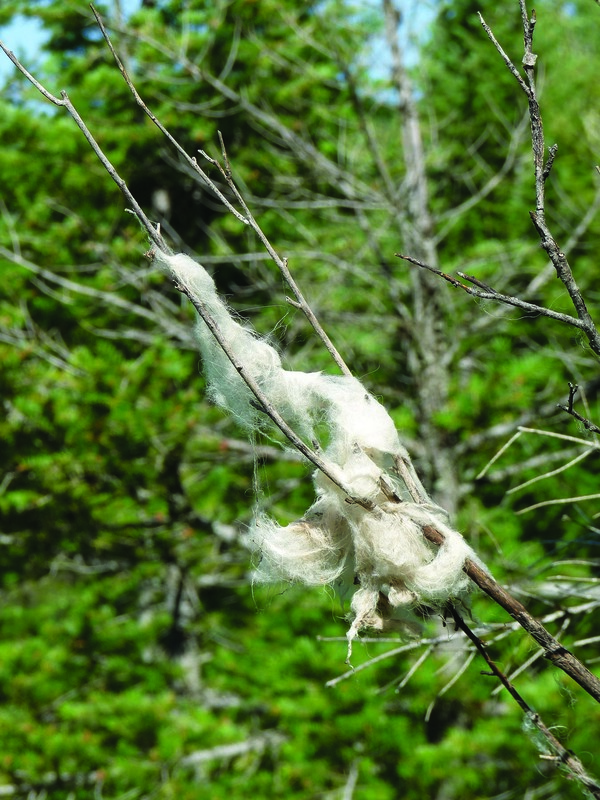 On a recent foray into Glacier National Park to photograph goats, tufts of their hair festooned wildflower stalks in a meadow travelled by the animals, as though the wild geraniums and coneflowers had been supplanted by a field of cotton. But here, not a wisp of shed hair fluttered from bushes or branches marking the white climbers’ passage. These observations only reinforced my mostly fruitless winter forays in search of the Bitterroots’ cliff dwellers. While the land itself was much as I remembered, the wilderness seemed empty without its goats. In 1974, I recorded 15 observations of the animals totaling 38 individuals in the same area I would scour in 2013. Ogling every fold and undulation, every ledge and meadow, the trails goats have travelled for millennia remained, just not the descendants of those who made them. In the past, I need only look longer or more intently, and these mountain monarchs would appear. Now I was saddened to find otherwise. The Bitterroots do not stand alone. 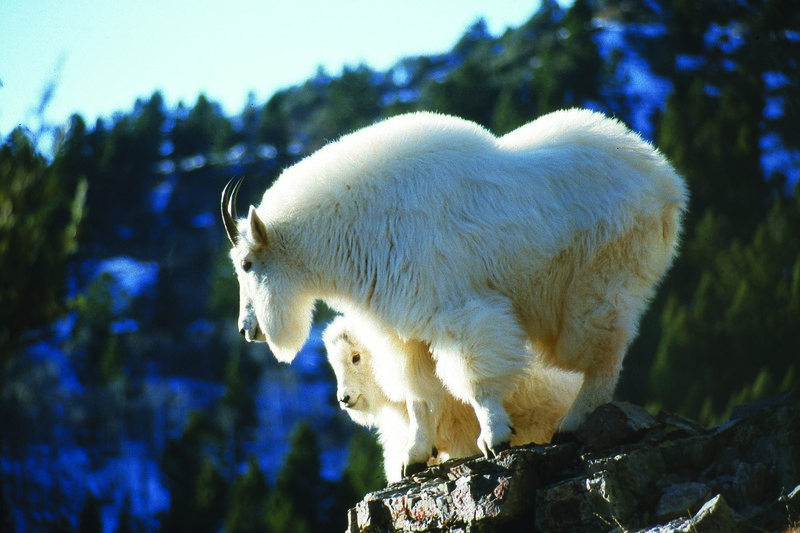 Over the past half-century, numbers have dwindled across Montana’s historic goat ranges. What survey data exists suggests that populations have plummeted by 85 percent in the Bob Marshall Wilderness. Shocking declines have likewise occurred in the Swan and Pintler ranges, and the Great Bear and Scapegoat wildernesses — all former strongholds of the Old Man of the Mountains. 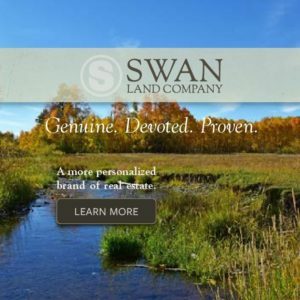 We know that herds that for generations have been anchored on the same pile of rocks typically have low birth rates and poor survival of young — a consequence of lives spent living on the edge. 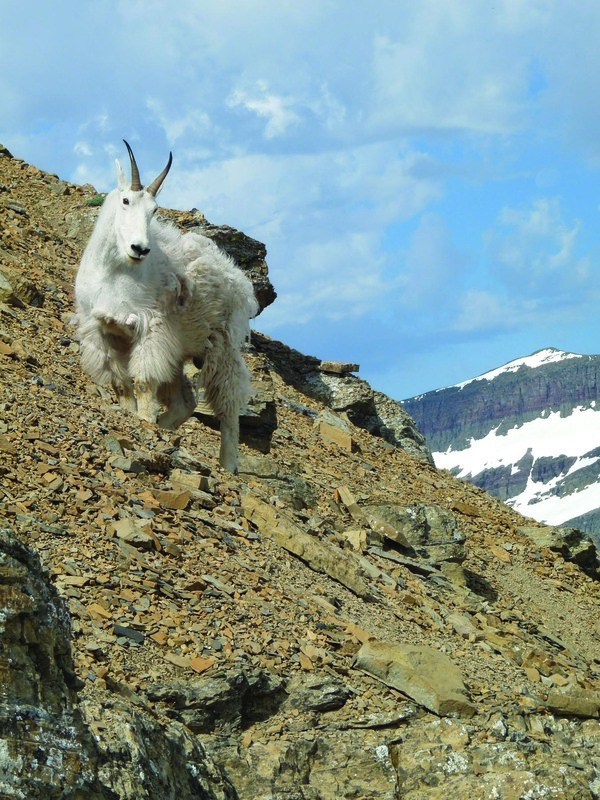 Studies from Montana to Washington, Alberta and British Columbia, conclude that excessive hunting in the past and our commercial intrusions for energy, timber and even recreation sometimes were incompatible with the goats’ persistence and reclusive lifestyle. Why do depleted herds often fail to recover after wildlife managers have reined in hunting quotas? Does the animal’s placid outward appearance mask physiological stress inflamed by snowmobiles and helicopters invading their world? Are predators the culprits as often implicated in declines of other herbivore species we hold dear? How is it then that before the recent arrival of Euro-Americans, the West’s large carnivores and their prey both flourished in far greater abundance than now? And is the changing climate — warming three times faster at the highest altitudes and latitudes than here below — a challenge for this cold-adapted, ice-age survivor? Questions are many, but answers are few about the animal’s prospects. We have much to learn to conserve this icon of the alpine that has lived and died out-of-sight and out-of-mind for most of us. 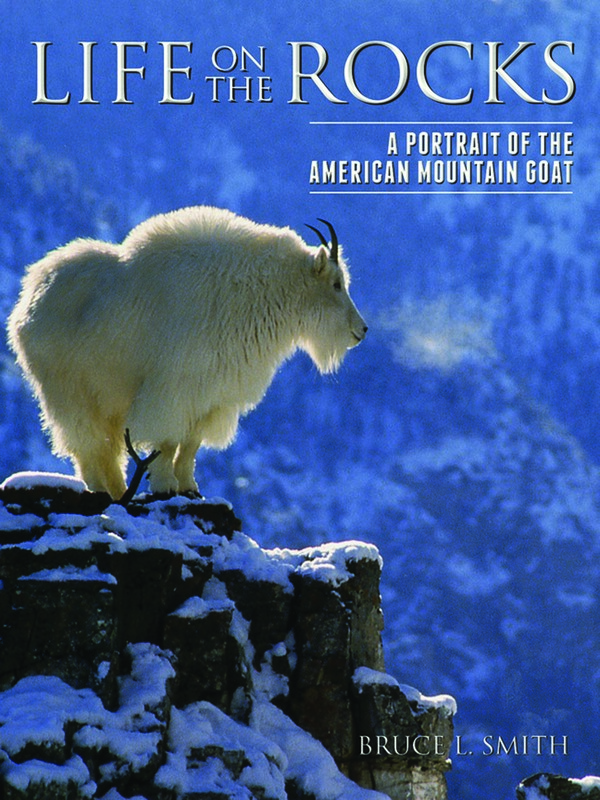 This journey was part of the author’s research for his ​new book, Life on the Rocks: A Portrait of the American Mountain Goat,​ in which he​ reveals this remarkable cliff-dweller’s life history and conservation challenges.